In the heart of the village of Oystermouth, All Saints is easy to find. If you stroll from the roundabout at the bottom of Newton Road, Oystermouth and keeping the White Rose on your right, move along the Mumbles Road in Oystermouth in the direction of Mumbles Lighthouse. Go past the Post Office, shops and houses, until you come to the drangway [pedestrian path] on your right, opposite the tennis courts, this leads you up to the Parish Church of All Saints which celebrates its 870th year of Christian worship in 2011. However it's very probable that there was a Church here before the first recorded date of 1141. There is evidence that the Romans were based in Mumbles in a villa on the site of All Saints. When the Church building was being extended in 1860, workmen excavating the south side of the grounds found a tesselated Roman pavement - mosaic flooring. Pagan sites in the Roman empire frequently became places of worship with the onset of Christianity. It is said that the Normans built the tower to defend the people inside from enemies. Originally the wooden doors at the back of the tower were the main entrance to the church. You may reach the belfry and clock chamber using the staircase – interestingly the stairs ascend in an anticlockwise direction designed to ensure that sword arms remained free. The first room that you reach allows access to the clock and onward to where the bells were kept. There is access to the roof which was a great vantage point from which to deter attackers. This military-style tower with its massive walls is similar to other towers in Gower and was originally designed to give protection to the Anglo-Normans from any sudden attacks by the Welsh! 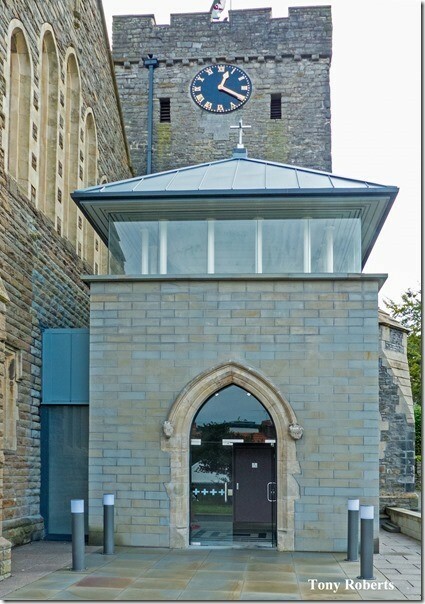 In 2016 the old Victorian porch was demolished and rebuilt in a modern design by the Church Architect, Dewi Evans. It includes clerestory windows and retains some medieval features - such as the stone heads and holy water stoop. The nave of the old building forms the south aisle of today's building and leads from the tower to the Lady Chapel. 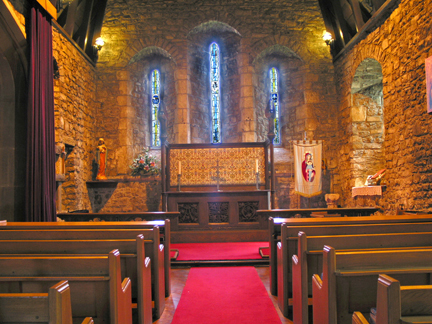 The Lady Chapel comprises the chancel and sanctuary of the original ancient church. It is a place of worship and quietness. There is a feeling of great peace here: it is medieval and the oldest part of All Saints. The altar front was carved by Rev'd John Davies a former Rector of Llanmadoc. The altar was presented to All Saints by Elaine, youngest daughter of Dame Catherine [Kate] Prudence Jenkins, in memory of her aunt Margaret Dinah Thomas. 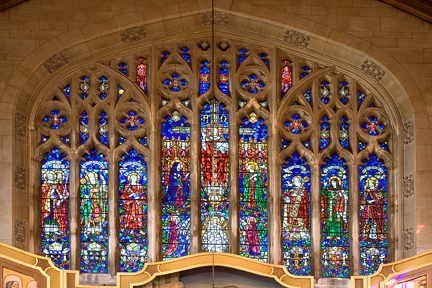 The windows behind the altar date from 1972 and are in memory of Archibald Johnson and his son Campbell Stanley. Made by Celtic Studios of Swansea. 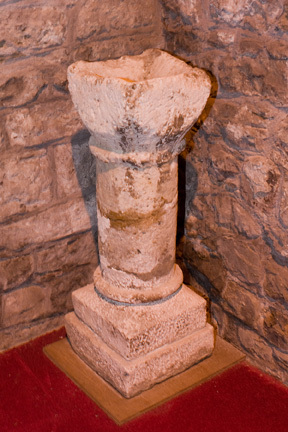 The ancient pillar piscina to the right of the altar is a stone basin with a drain and dug up some time before 1849. It is probably the oldest relic in the Church. Directly above the high altar is a large, imposing and colourful window in memory of Col. David Lewis, sometime Church Warden. The themes of the window are Christ the True Vine, Christ in Majesty, and the Saints of the cathedrals of Wales: St Peter and St Paul (Llandaff), St Asaph, St John (Brecon), St David, St. Woolos (Newport) and St Deiniol ( Bangor). The tracery of the window was designed by Leonard William Barnard 1870-1951, the architect of the Church. Victorian in origin, this ornate and beautifully carved altar with gilded leaves, has three painted panels. The central panel depicts the Three Wise Men visiting the baby Jesus; on the left the visit of the Angel Gabriel to Mary -The Annunciation; to the right the Parable of the Lost Sheep. The impressive Reredos, immediately behind the High Altar, depicts the Epiphany of Our Lord and is based on the theme, ' and I, if I be lifted up from the earth, will draw all men unto me.' The Three Wise Men bearing their gifts are the first in the queue which shows men, women and children of all nations coming down through the ages to pay homage to the Christ Child. The concept of time and distance is beautifully displayed and conveyed. The Reredos was designed by G B Beadle of Faith Craft Works, London. It was dedicated on All Saints Day [Nov 1st] 1951 and a major feature is the raised, carved images of the Wise Men and the Holy Family. The left wing shows paintings of the Presentation of Christ at the Temple and the Baptism of Jesus while the right wing shows Pilate washing his hands and Jesus appearing to Mary Magdalene on Easter morning. There is a similar reredos in the Church of St. George, Southall, London erected in 1951 by Faith Craft Works as a memorial of the 1939-45 War. 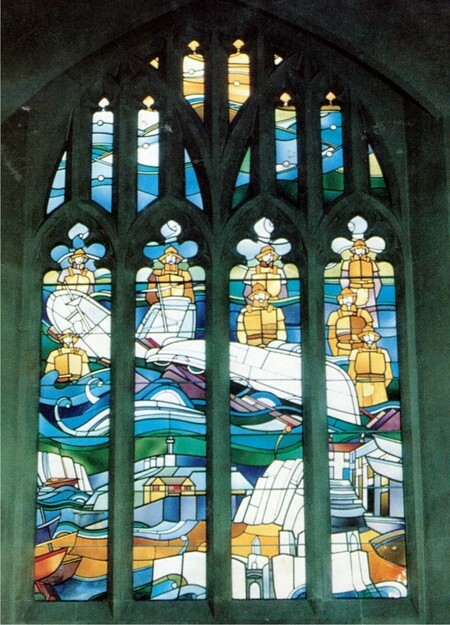 The Lifeboat Window is perhaps the most famous of the windows. It is in memory of the eight lifeboat crew who drowned attempting to rescue the stricken ship “Samtampa” stranded on the rocks off Sker Point, Porthcawl in 1947 during a hurricane-force gale. Read more about this tragic event. The window was installed in 1977 and tells the story of a major lifeboat tragedy with the wreckage of the “Samtampa” and the upturned lifeboat in the centre. In the top of the window, the eight lifeboat men are standing over the roaring sea. Their souls are represented by small white circular stars in the sky ascending to heaven. In the bottom of the window are rocks, the lifeboat house and a village street with cottages. 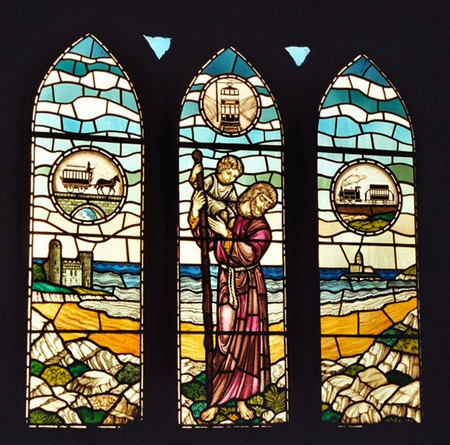 The window was designed by Tim Lewis of Swansea, with Glantawe Studios, Morriston, Swansea. Other windows are described in the gallery.